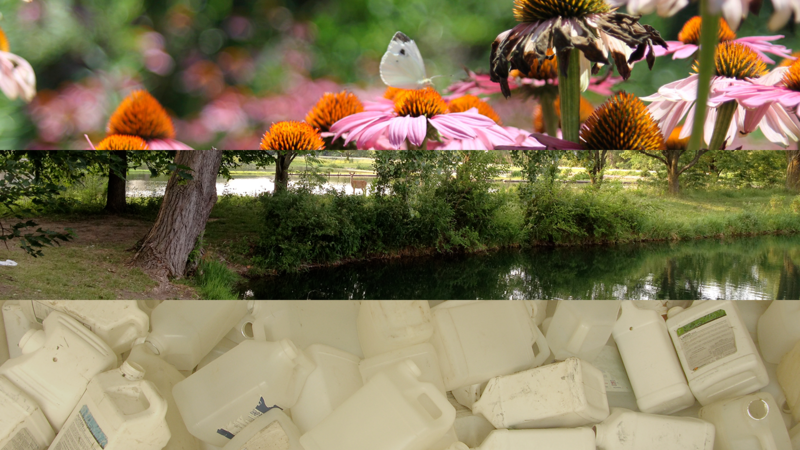 Find the town nearest you to recycle your plastic pesticide containers. This program is designed to recycle the plastic from rinsed (triple or pressure) pesticide (or crop oil, adjuvant, surfactant) containers (1.0 or 2.5 gallons) or crop protection chemical drums (15, 30, or 55 gallons). Applicators can use this web site to determine if sensitive crops or habitats are near a planned pesticide application site so that they can adjust their procedures (timing or application method) accordingly. Listings on the locator are voluntary. This new general permit for pesticides, recently finalized by NDEQ, became effective November 1, 2011. Read the press release, fact sheets, and question & answers for information. If you are unable to recycle or landfill your containers, some labels allow burning them. Learn about what you need to do to execute a legal container burn. Links to EPA Web pages on pesticide information. Pesticide disposal, household hazardous waste disposal, business waste disposal, and recycling programs for cities in Nebraska. Don't throw away your Tyvek suits in the dumpster following weed spraying—recycle them. Order a Recycling Kit here that will hold over 250 square feet of Tyvek® materials—the price includes the recycling kit, return shipping, and recycling. These NebGuides offer information on pesticide safety to include sensitive environments, endangered species protection, stormwater management, rinsing containers, spray drift, and cleaning application equipment. In preparing for the application season, please take time to plan your use of herbicides to assure on-target deposition. Find information about accurate applications here. All pesticide and fertilizer users should be mindful of protecting surface and ground water from contamination.